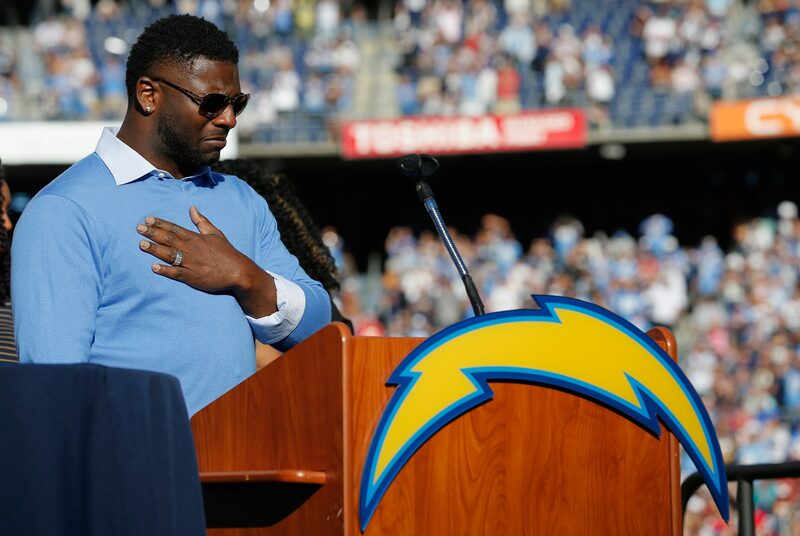 Legendary San Diego Chargers running back LaDainian Tomlinson is one step closer to the Pro Football Hall of Fame. Tomlinson was among 15 finalists announced for the Class of 2017, which includes some very worthy candidates for football immortality in Canton. Included in that batch are players like wide receiver Terrell Owens, quarterback Kurt Warner and safety Brian Dawkins. The veterans committee has selected Seattle Seahawks safety Kenny Easley as a finalist. Nominees in the contributors category include former commissioner Paul Tagliabue and Dallas Cowboys owner Jerry Jones. The class will be finalized on February 4, just before the Super Bowl. But we can’t wait that long, and I’m going to tell you five players that should be hearing their name inducted in August. Tomlinson looks to be a pretty strong candidate as he was one of the top running backs in the league when he played, with two rushing titles and an MVP season that saw 26 rushing touchdowns. He was arguably the top running back in the league in his prime and feels like an easy pick for the Hall of Fame. He may be the closest thing to a sure thing for this Class of 2017 as any other candidate, but there are some strong candidates to consider as well. One player who should be a lock but inexplicably is not considered one is wide receiver Terrell Owens. Owens is the NFL’s second all-time leader in receiving yards and third all-time in touchdowns, but his antics and personality while he played will turn off some voters who take it upon themselves to hold their ballots in high regard and snub players who may not have been all that easy to work with. Owens has a polarizing history, sure, but he was one of the most dominant players of his time and nothing should take away from that. One of the big questions to ask is how likely a safety is to make the Hall of Fame. And if a safety is going to make it, would you go with John Lynch or Brian Dawkins? Personally, and I’ll admit some local bias here having watched Dawkins more than any other option, I think Dawkins is absolutely a Hall of Fame player, but the sentiment may not be clamoring this year to get Dawkins in enough to actually get him in. Lynch may have a better shot, as he has already been in the mix in this process. I’m not sure either gets in, but I also wouldn’t be stunned if both made it. I’m going with another running back, because I find it too easy to overlook offensive linemen and don’t think we’ve reached the breaking point for a kicker just yet. That means Terrell Davis is in, despite his relatively short career. It was a fantastic relatively short career. In seven years, Davis was a key part of two Super Bowl championship teams in Denver. He ran for 2,000 yards. He was a Super Bowl MVP. Like Tomlinson, he also earned an MVP award. Who are you sending to the Hall of Fame this year?